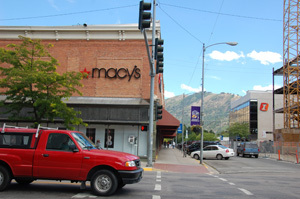 With so much of the afternoon still open, I hopped right back into the car and headed for downtown Missoula to visit the haunted Macys building. It has a red-brick exterior and looked like a normal everyday Macys inside -- at first. Then I started noticing the details: super high ceilings molded into intricate design, old staircases to the second floor, fancy old skylights. And when I asked the staff about the ghost story, the lady who waited on me said: "Oh, that's Walter." She told me there had been sightings of Walter in the building, and that he was one of the former owners of the old Mercantile building which was eventually sold to Macys. Another clerk I interviewed took me downstairs to the basement to show me the catwalk leading to the sub-basement where Walter McLeod had been seen several times in separate encounters. Everyone who saw the ghost described him as an older fellow with a worn face, wearing a plaid shirt and overalls. One girl who worked in the store and who has a background as a psychic, said she got goosebumps every time she went downstairs and felt like someone was watching her whenever she ventured into the 'dungeon'. She never knew why, until today when she overheard one of her coworkers talking about Walter's ghost. After my spooky visit to Macys, I stopped at a local camera store to get my lenses cleaned, preparatory to tomorrow's visit to the National Bison refuge. Hoping to take marvelous pictures! I also picked up a tripod to stabilize my massive new 80-400mm Nikkor lens. Then I rode around town taking photos of the county courthouse, the university - where I hear tell there is a whole class haunting the Jeanette Rankin Hall; Brantly Hall is haunted by the ghost of a female student who committed suicide; and the Theater which is haunted by both a spectral dog and a dedicated theater goer. Cool stuff. I finished my downtown tour with a trip to Caras Park to ride the Carousel for Missoula. It was so much fun to zip around and around and up and down. I even managed to snag a blue ring, but didn't get the brass ring for the free ride. 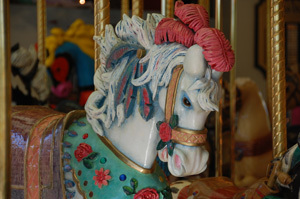 The carousel horses are all hand-carved and each one is different. They were fabulous! The day closed with a trip to Target for a 24 pack of water to take on my journeying, some snacks for the road, and a nice Italian dinner. A quick dip in the pool and early bed, since the bison will be up and at 'em at dawn tomorrow! A great day!! After a hasty breakfast at C'Mon Inn, I drove up to the National Bison Range Wildlife Refuge on the Salish/Flathead Reservation. It was a glorious drive with the Mission Mountains rising up before me as I turned into the lane leading to the Visitor Center. The parking lot was empty when I pulled in right next to a huge display of antlers piled ten feet high around a pole. That was an interesting beginning! After purchasing a ticket to the refuge, I drove a nineteen mile circuit on a gravel road, traveling up and up large mountains and switchbacking my way down again. I saw several male bison immediately out of the gate, and a moment later saw a golden eagle hunting on the side of the mountain. Wildlife were slim after that, until I drove to the far side of the mountain and found part of the herd dozing lazily among the pine trees, tail flicking every few seconds to keep off the flies. OF COURSE they were behind a fence so I couldn't get any good shots. Figures! At the midway point, I took a hike to a scenic overlook. My solitary reverie over the beautiful valley and mountain peaks was interrupted by some tourists who followed me down the path. One lady looked out over the Mission mountains and said: "I don't think this is beautiful. It is just a lot of rocks." My eyebrows rose at this statement, as I took in the misty-mountains with snow still clinging to the highest peaks, the valley spreading out for miles below them, marked by small farms and cultivated fields. If this was 'a lot of rocks', I'll take it, I thought as I hiked back to my SUV and drove to the next scenic overlook. After switching back down the mountain on a very steep, very nerve-wracking gravel road with no guardrails and a potentially deadly fall if the wheels of the SUV slipped, I reached the valley floor, where I saw some pronghorn sitting calmly in the middle of an immense field, followed by mule deer near a stream and the rest of the buffalo grazing just above the herding pens where they will be gathered together once a year during the roundup. 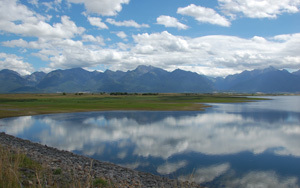 Then I was back on the road, stopping briefly at the Ninepipes Wildlife Refuge to gawk at birds and take photos of the Mission Mountains reflected in the lake. A quick lunch set me up for a nice scenic drive around Flathead Lake and by mid-afternoon I was in Kalispell. Seeing a sign for the Conrad Mansion museum, I took a right and followed my nose through a neighborhood of tiny houses, to the end of the street where loomed an amazing shingled house that just had to be the place. The next tour was at 4 pm, so I wandered the garden, talking to one of the staff members who just so happened to be the 4 pm tour guide. And bingo! She had a ghost story about the house! Seems that the final owner -- one Alicia -- (before it became a museum) was once seen by a relative driving passed the old homestead. She was seen leaning against her father's leather top desk in front of the library window, and she looked just like her wedding picture. The man did a double take, and when he looked again, she was gone! The Victorian mansion was filled with amazing furniture and wonderful stories, and I got some photos of the haunted room and took photos of photos of Alicia, who loved her home so much she returned to visit after death. The day concluded with a relaxing dinner and a swim at the pool at the Holiday Inn in Whitefish. They had a water slide, which I couldn't resist trying out! Fun! A Walk in the Treetops. It sounded cool in the brochure. But rising early and winding my way up and up Big Mountain, I realized I was getting jittery. It's not so much heights that get to me as the notion of falling from said heights! Still, I've always been an adventurous soul, so I was determined to try it. My first adventure was finding the dad-blame place. I ended up at guest services who directed me to an obscure ticket booth in a lower parking lot practically invisible from the road. 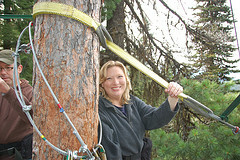 There I checked in and met the other intrepid treetop walkers, along with our two guides. We were driven to a small waiting tent in the back of beyond, strapped into elaborate harnessing, and set up with partners. My partner was Mike, the odd man out in a family party of five. The family decided to adopt me as one of their own, and we got along famously the whole trip. Mike and I had to check each other's ropes/clips to make sure they were securely fastened to the overhead wires. We were going to be seventy feet up, and the guides weren't taking any chances! A half-mile hike through a pine forest brought us to the base of the treetop climb. Yikes! Only two boards wide, with wire handles on either side, it was basically a huge suspension bridge strung from one giant larch tree to the next, up to two platforms suspended seventy feet above the ground and swaying gently in the breeze. I took a couple of determined breaths to calm myself, clipped my green and yellow safety ropes onto the overhead wire, and walked the swaying suspension bridge up to the first tree, where Mike supervised me moving my clips to first a ring and then the next set of overhead wires, and then I did the same for him. the biggest problem for me was figuring out how to safely brace myself when I reached a transfer point. Some of them were so far away from the tree itself that I had nowhere to anchor my feet while my hands were occupied. Scary stuff at fifty feet above ground! After the Treetop Walk, one of our guides gave me a tip about the old Chalet building looming over the parking lot, which was said to be haunted. He arranged for a security guard to give me a tour, and Nick not only showed me the building and talked about what it was like inside after dark, but he also took me to a second building where staff members had heard phantom footsteps while alone in the building at night. Creepy stuff. After my impromptu ghost tour, I rode the lift to the top of the mountain to have lunch and then do some scenic photography of the Swan Mountains. 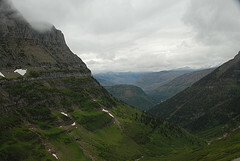 Then I saddled up my SUV and headed into Glacier Park. Whew! What a place. Amazing mountain view after amazing mountain view. And the Going to the Sun road was both breathtakingly beautiful and terrifying. Steep and narrow and winding with sections without guard rails and plunges more than a thousand feet deep. Oh boy! I'm glad I didn't know what kind of drive it was before I started. It is not for the faint of heart. I crossed the Continental Divide at Logan's Pass, and couldn't see a thing because the clouds had descended and it began to snow! Snow! On September first! That was the worst part of the drive, in fog so thick I could barely see, and no friendly car tail lights in front of me to ease the way. Alone in the whiteness, I clung to the center line passed (had I known it) even steeper drop-offs and more frighteningly narrow twists in the road. 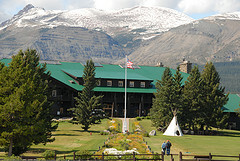 Then I was out of the clouds and down the other side of the mountain, and heading for my final destination -- the magnificent old Glacier Park Hotel. My first thought, seeing the massive historic building, was that this was what Disney tried to be, but couldn't. You couldn't replicate the amazing building with giant Douglas Fir tree trunks ringing the lobby like the backwoods version of Ionic columns and balconies edged by rough-hewn logs, aged to a dark brown by almost a hundred years of history. I gaped and gawked, my head spinning with fatigue, and almost fell over when i realized that the old building had no elevators and I had to drag my bags to the third floor! I made it fine the first time, but after dinner I was so fatigued I actually tried to unlock my neighbor's door instead of my own! Fortunately, he had a great sense of humor and whipped the door open in my tired face and demanded to know if I'd brought a bottle of wine with me!! After staring at him a moment in complete shock, my mind got the joke and I laughed as he pointed me to the room next door. Needless to say, I called it a night and went right to bed!! I signed up to go on an historic red bus tour today -- and of course woke up to heavy rain, low clouds and occasional bursts of snow! We went anyway, crossing the Continental Divide twice in a little red bus that's been around since the beginnings of Glacier National Park (literally), jammed in four to a seat with the other tourists. It was so cold at first that we all huddled together under a blanket --total strangers! We jumped out to see the Continental Divide at Marias Pass -- a haunted place itself that was long avoided by both the Blackfeet and the tribes to the west because a huge, deadly battle in this location had created terrible ghosts and bad medicine. All I felt at the time, as huge snowflakes whirled across my face, was cold! I had the seat by the door and got every draft!! Next we stopped at a mountain goat lick, but the mountain goats were smarter than we were and had stayed under cover. 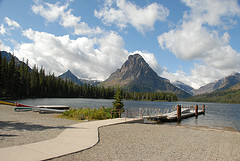 Then we were in the park itself and stopping at Lake MacDonald Lodge for lunch. Basic lunch fare, but you can't beat the atmosphere. The rain/snow had let up so we could go outside and get photos of the lake. Inside was a huge log fire. Each log on the fire was a good five feet in length!! The fireplace was painted and carved all over with replicas of Native American Petroglyph's. Very cool. 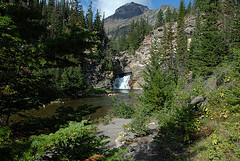 After lunch, we took a short hike among the Cedars, stopped at sacred waterfall where Native Americans came for their visions quests, and then started the long, steep, narrow climb I took yesterday -- up and over Logan Pass and our second crossing of the Continental Divide. The view was still breathtaking, and much easier to take pictures of when you aren't driving!! Our driver took the canvass top off the bus so we could see the mountains right over our heads! Very cool. Of course -- of course! 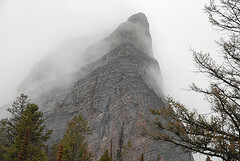 -- the clouds descended suddenly upon us right at Logan's Pass, so once again my trip down the eastern side of the mountains was foggy. Not as bad as yesterday, but the mountains on that particular stretch of road are still a mystery to me! We stopped to take a hike to a point overlooking St. Agnes Lake, and the bus driver told us the story of the little island in the center -- Goose Island. It seems there were two tribes, living on either shore, who didn't have much to do with one another. One day, a handsome warrior on one shore saw a lovely maiden swimming toward the island from the other shore and he swam out to meet her. They fell in love, and spent the whole day talking. When they got home to their respective tribes that evening, there was great displeasure in the match. So the two snuck away the next day and met at the island again, hoping to run away together. But the leaders of both tribes sent out parties to retrieve the miscreants. When they arrived at the little island, the only thing they could find was a pair of geese walking on the shore. The Great Spirit had changed the young couple into a pair of geese -- who mate for life - so they could live undisturbed by their peoples. At our last rest stop, the bookstore had copies of Spooky Campfire Tales, which I signed for them. Pretty cool. Then we were back at the lodge. I had a lovely Beef Stroganoff for dinner and then spent an hour and a half interviewing members of the staff about the spooky stories surrounding the historic building. The security guard showed me the place where the ghost of a suicidal housemaid had been seen, and a few other spooky spots. I even collected a few ghostly tales from other places the staff had been. It was a nice -- if spooky -- end to the day, and I will admit I didn't sleep too well in that building after hearing all the tales! Today I woke up to clear skies and sunshine -- at last! To my amazement, the lodge really was nestled at the foot of snow-covered mountains. Who would have guessed? I was so inspired by the ghostly storytelling of last night that I wrote up two stories for the book before getting down to mundane tasks like dressing and packing up. After breakfast, I spent the morning at the Lakes of Two Medicine. First stop was Trick Falls, renamed Flying Eagle falls after a Blackfeet warrior-maiden who used to lead the men on war parties against other tribes. A plucky gal! Then I visited the historic chalet at the middle of the three Two Medicine lakes, where President Franklin Delano Roosevelt had once given an address to the nation from next to a very broad very lovely fireplace. 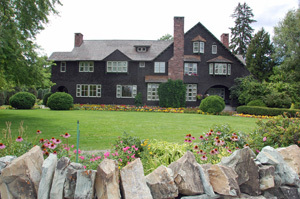 Yes folks -- that little chalet is where FDR's radio addresses became known as Fireside Chats. They have a lovely store there now, and I picked up some huckleberry chocolate, since huckleberries are a big deal in this part of the world. I wandered outside to photograph the magnificent mountains around the lake, and then took a two-mile hike out to the beaver meadows and back, hoping to see moose. I kept seeing large patches of dung that I thought might be moose droppings, but turns out they were droppings from a grizzly bear! Glad I didn't know that until after I returned from my hike. The beaver meadows had lovely pools of water and long tall grass full of flowers and glamorous peaks six-ways to Sunday. I decided to build a house there, but the park rangers wouldn't let me! Still, now I know where my dream place to live is: In a mountain valley like that one! Suddenly tired, I sat under a small pine tree for some trail mix, huckleberry chocolate, and water. I couldn't help noticing the claw marks all over the tree as I perched myself upon its roots. Some bear had been marking this spot! On my way back to the car, a partridge flew right by me and then perched curiously on a fallen log a few feet away. We studied one another closely, and then she wandered casually off. Must have decided I was harmless. It was a long drive to Great Falls, with no attractive restaurants that I could see, so I ate graham crackers and peanuts to tide me over to dinner. I passed a dinosaur museum and interesting looking rock shop in the teensy tiny town of Bynam and paused for a break at Choteau, the location of Egg Mountain where the maiasaurus nests were located so many years ago -- transforming the field of Paleontology. i visited the little museum next to the information center, and took a look at their saurian display. As I stopped to use the facilities at the information center, they advised me to go back to bynam and look at the museum there. Since it was only 13 miles, I took their advice and backtracked, only to find the museum closed. Frustrated, I jumped in the car and started to drive off. 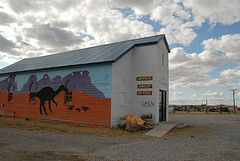 Then I did a quick right into the parking lot of the rock store, which advertised fossils and more on its small sign. I'd backtracked all this way, I might as well see something, and the store looked kinda cool. I came away with a head full of knowledge and some fun fossils to show my family when I get home. (Did you know coprolite was fossilized dino dung? Can't wait to show my nephews!) My hotel in Great Falls was easy to find and had a fancy inner courtyard with a lovely pool and hot tub, surrounded by a creamy red brick. So now I know where my dream house would be located (if Glacier would let me build there) and what my pool/spa would look like. Nice! I was lazy this morning, rising late and doing some leisurely writing before a late breakfast. I managed to get myself checked out before they kicked me out, but only just! Then I wandered over to the Lewis and Clark Interpretive Center overlooking the Missouri River and spent a delightful time reviewing the details of their epic journey. What a fantastic museum. 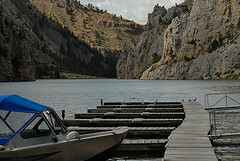 In the afternoon, I drove down the incredibly scenic I15S from Great Falls to Helena, pausing at the Gates to the Mountains -- so named by Lewis and Clark -- to take a scenic boat tour and learn about the rugged canyon through which the intrepid explorers came. Limestone walls loomed over us, and I saw a bald eagle hunting and mule deer grazing, and at the rest stop at an isolated camping site, there were recent signs of a large bear who must have slipped out of sight right about the time the boat was docking. The canyon was also the site of a terrible box canyon fire that killed a number of smoke jumpers back in 1949. What was learned from that fire revolutionized the way forest fires were fought in future, but it came too late to save the men who perished that day. Apparently, the fire jumped the canyon and came roaring up the side where the men had landed. It was a massive wall of flame. One man lit a small counter fire and laid himself down among the ashes. The forest fire went around his burnt out area and his life was saved. The only others who made it out alive and relatively unscathed were two rookie jumpers who got on a rock slide with little fuel to burn and ran back and forth until the fire had passed. I finished the scenic drive to Helena and settled into my hotel after a nice, relaxing drive around town to view the Capital building and the historic downtown area. Helena was once a booming mine town, and you can still see some of that in the name of the roads, such as Last Chance Gulch. According to the story, Helena was inadvertently started by 4 Georgian gold hunters who stumbled into the area after many fruitless months of searching for the fabled ore. On July 14th, 1864, the men decided to take "one last chance" looking for gold. They started panning for gold in the nearby creek, and they found it that very night. So they named the stream Last Chance Gulch, and Helena quickly became a boom town. originally, the town was called Crabtown after one of the Georgia boys who founded her, but soon it became Saint Helena and was eventually shortened to Helena. A great town, and now capital of Montana. Today was a research day in lovely Helena, capitol city of Montana. I spent the morning in the Montana Historical Society archives, where several delightful librarians had prepared a whole cart full of spooky materials for me to review. Very nice of them. Then I nipped outside into the noticeably chilly weather and met one of the Spooky Series editors for lunch at the Globe Pequot/Falcon offices in downtown Helena. Erin was a delight, and being a Helena resident we discussed the spooky stories and historical sights as we walked about 3/4 of a mile down to an historic building turned restaurant that had a great atmosphere and great fries. After lunch, it was back to the Historical Society to finish my Montana folklore research, and then off for a quick drive across town to photograph the very spooky St. Charles building, part of Carroll College, where a closed-off bathroom in one of the upper stories is reputed to have a sink that bleeds! Creepy stuff. My path led next toward Butte, up and over tall mountains and down again. As Butte came into view, I noticed someone pulled over on the verge, taking a picture of something above my head. 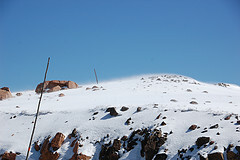 A glance upward showed me a huge white statue of a woman at the top of the mountain. I pulled over at the scenic overlook about a quarter mile down the road, and took photos myself of Our Lady of the Rockies, a ninety foot statue of the Madonna which sit atop the Continental Divide. Lovely. Then I drove down into Butte and made my way to dinner and an early night. The muse was upon me as soon as I woke up this morning, so I sat down right away and wrote another story for Spooky Montana. This one was about the Conrad Mansion I visited a few days ago, written from the perspective of the ghost. Then I went to Perkins for some pancakes and headed up the mountain to the World Museum of Mining. What an amazing place. 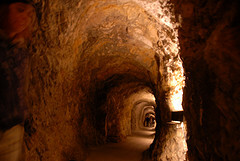 It is located on an original mining site called the Orphan Girl mine. Some of the original structures are still visible! This includes a 100-foot-tall head frame and a hoist house filled with huge equipment for pulling miners and ore down and up inside the mine. You can still see the cages/elevators that the miners used. Small boxes in which six or seven miners crammed in with their lunches on top of their heads to make more room. They rode each day 2700 feet down the shaft. Sometimes it would take forty-five minutes to get down into the mine and over to the place where they were working! I spent quite a bit of time exploring Hell Roarin' Gulch, a re-created mining town circa 1890. 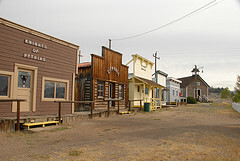 About 15 historic structures are preserved intact in the replica town, and another 15 were built from old materials by museum volunteers. The buildings are crammed full of period artifacts. 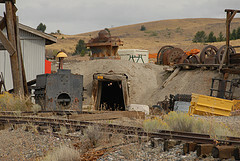 It was a great way to see what life was like in a mining town! Then a recent graduate from the local mining college took several of us on an underground tour showing us the original elevator shaft of the Orphan Girl mine and much of the equipment used -- both historically and today -- inside the Butte mines. It was an incredible experience, down in the dark wearing hard hats with miner's lights and trying to absorb a whole way of life in one go. For anyone wishing to understand Butte, this tour is a must. When I left the museum, I drove out to the Berkley Pit, a former open-pit copper mine that is over a mile and a half wide. It contains about 900 feet of contaminated water. The pH level of the water is 2.5, and it is chock full of heavy metals and dangerous chemicals such as arsenic, cadmium, zinc, and sulfuric acid. Yikes! After lunch, I drove out to the Lewis and Clark Caverns State Park, a miracle deep inside the mountain canyons near Three Forks. Lewis and Clark had explored the very mountains and valleys whe re I walked on their epic journey west. The entrance to the cave itself was at the top of the mountain, just under the peak, and Lewis and Clark must have passed right by it, unknowing. It wasn't officially discovered until 1892. You have to walk nearly a mile up about an 800 foot incline to reach the entrance. The view alone is worth the climb, but the cavern itself is even more fantastic! Not for the faint-of-heart or the claustrophobic, the cavern twists and turns and sometimes you have to bend nearly in half to crawl under a two/three foot ceiling and sometimes you have to sit down on the stone and slide down to the next level. Parts of the cavern are huge and echoing, and some tiny chambers we came through would make a good playhouse for toddlers. I confess it was one of these tiny miracles that I favored the most. For some reason, I responded to that little space as a mouse might respond to its favorite hole. It looked like a good place to curl up for a good winter's sleep - small and cozy and not at all frightening though it was hundreds of feet below the surface. We hit one place where we were a mile above sea level and still hundreds of feet below ground. That was weird! Our tour guide was hilarious, with a dry sense of humor that kept everyone laughing as we crept and crawled, walked and slid through the third largest cave in the USA. My day ended happily with spaghetti and meatballs in Bozeman, followed by a relaxing swim and bed. I can't believe I spent so much time underground today!! I had a relaxing breakfast this morning, sharing the table at the hotel lobby with a delightful senior lady who discussed everything from travel to politics to child-rearing in such a humorous, delightfully wise manner that by the end of the conversation, I sincerely hoped that I would someday be like her. I spent the rest of the morning in the Museum of the Rockies, gawking like a second grader at all the dinosaurs and enjoying the film in the planetarium. I was amazed at how many dinosaur skeletons are preserved beneath the soil in Montana, and read with delight the story of a woman who accompanied her husband fishing and sat down right next to two Tyrannosaurus Rex bones! She took them to the museum, and caused quite a stir!! After lunch, I drove to Prairie Dog state park. 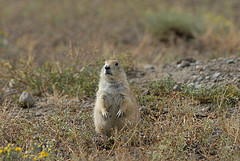 I spotted my first prairie dog about 3 seconds after entering the park. They were everywhere! I was their sole visitor at the time, and they called warnings to one another and flicked their little tails and scurried to the nearest den, staying outside it to watch me with as much curiosity as I watched them. I took a large number of photos, and stayed so long that the little creatures finally decided I was harmless and went back to their normal pursuits. I know they can be pests and the holes they make are dangerous to horses and other large animals -- but they are still awfully cute!! I hurried on to Billings, passing the town of Laurel on the way. Since this was once the home of Calamity Jane, I took a side trip down Main Street, trying to imagine the town as it must have looked to Calamity Jane back in the 1890s. During my research in the Montana Historical Society Archives, I read an interview with an old timer who just barely remembered what his parents had told him about Calamity Jane. Apparently, she lived in a small cabin on top of a small plateau with only one way up or down. She kept this way blocked and successfully put a herd of horses to graze on top of the plateau. They were small, sturdy mustangs by the description, and they never fell off the plateau, so they must have been pretty smart. Calamity was a bit of a wreck by that stage in her life. She dressed and acted like a man, so she was rejected by the womenfolk of Laurel, and when she drank, she grew unpredictable and landed herself in the slammer. But when a woman fell ill or had a baby, she was right there to help her, and her nursing skills were tremendous. Calamity Jane was a woman of contradictions. When I reached Billings, I found my parents had arrived safely. I talked their ears off about all my Montana adventures over dinner, and pulled out all my fossils purchased at the rock shop in Byntin to show them after supper -- just like when I was a little girl! My, it was nice to see them! They were pretty wiped after their long plane ride, so we cut the evening short and had an early night. After a nice breakfast, Mom, Dad and I headed out to the pictograph caves, which were just down the hill from our Billings hotel. The caves were in a little box-canyon and there were two of them – one filled with ancient, faded pictographs and the other filled with nothing but ghosts! There was a nice easy trail through the little canyon – and lots to look at on the way. Jackrabbits were everywhere! You couldn’t turn around without seeing a bunny, and they weren’t terribly alarmed when my father and I strolled by. The pictograph cave itself was a bit disappointing. It was basically a huge hollow in the cliff with a lip of stone over the entrance like a lentil. And most of the pictographs were either completely faded and too far away to see, or had been vandalized at one time by graffiti and had faded when the graffiti was removed. Only the most current pictures painted with some type of red pigment were visible, and there were not too many of those. Still, I’d finally seen ancient pictographs in their natural setting, and the hike alone was worth the trip. Dad and I continued around the box canyon on the trail, and I hiked up to take a peek into Ghost cave. It was a very shallow cave – mostly an overhang – with steep sides and huge, interesting round rocks sticking out from the rear wall. 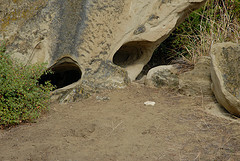 According to the sign, spirits have appeared in pictures taken of the cave, though when they were taken no one was there. I snapped a few photos myself, just in case. The only one there at the time was a jackrabbit, who peered at me nearsightedly for a moment and then scratched his ears. So much for ghosts! Unless you believe, as some folks do, that we come back as animals or other creatures. Then maybe the jackrabbit was a reincarnation of someone who once used the cave… Ah well. We will see if anything shows up in the photos! Next, we turned our footsteps toward the Little Bighorn. An hour’s drive put us at the edge of the battlefield, where we stopped for lunch and a quick browse in one of the local trading posts. They had a small museum attached to the store, so we purchased tickets and watched a film about recent archaeological excavations that took place on the battlefield. Fascinating to learn how archeology helped recreate the events of so long ago. Then we drove to the battlefield itself. 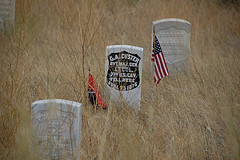 After a second film on Custer’s last stand, I wandered up to Last Stand Hill to look at the monuments, the markers where the brave soldiers of both Native and European descent lost their lives, and to sense – if I could – some of the ghosts which are said to inhabit that haunted place. Unfortunately, there were too many tourists there at the time to do more than snap a few photos and pause for a moment of silence. Then I headed down to the museum store to pick up my parents. We drove all around the battlefield, from Reno’s crossing to Last Stand Hill, reading about each significant point of the battle and discussing it as we viewed the lovely rolling hills that were once the scene of so much chaos and death. It started to rain hard as we retraced the last hour or so of Custer’s life, and this seemed fitting as the grave markers grew more dense, and we finally arrived at Last Stand Hill, where the overwhelmed Seventh Calvary units lost their final battle. What a tragedy that battle was. And how hard it was to see such a monumental clash of cultures: the nomadic and naturalistic culture of the Native Americans and the property-oriented, industrial culture of the European-Americans. Feeling both sad and introspective, we headed back to Billings. A nice meal at a steakhouse cheered everyone up, and I spent the evening doing laundry and floating around and around in the hotel pool. The water was so clear and still that it reflected the lovely décor around the pool. So it was like floating in a picture. Pretty cool. Today we drove the Beartooth highway into Yellowstone. It was an exhausting, long trip, but worth every minute of the drive. The Beartooth highway twists and turns through amazing, snow-covered mountains, up to a lovely scenic overlook. After taking many pictures, I turned left to continue up the mountain, expecting any moment to encounter the pass at the top of the range. But no! I found long fields, first of grass, and then of snow. And the car would move around a curve, and the land would fall away to reveal a hidden lake several hundred feet below, surrounded by snow. And still the car went up and up, with snow fields everywhere you looked. At 10, 947 feet, we finally reached the summit! The wind and snow were so cold that I took a fast picture and fled back to the car. And then we reversed the process, moving through the snow downward through amazing scene after amazing scene. My favorite photo-op came when I saw a funny little snowman at the edge of a snow-covered parking lot, looking out over an amazing scene of snow-covered peaks, and shimmering mountain lakes. We finally came into the more temperate zones, away from the snow, and stopped for a quick stretch at a little way-side campground. The mountains loomed above us now, lovelier than ever, but we no longer needed coats and the meadows were filled with fall wildflowers and yellowing meadow-grass. After a short stop in Cooke City for lunch in an outdoor café, we headed into Yellowstone National Park. By now it was 4 pm, and I had little hope of viewing wildlife. But the park surprised me. The mountains weren’t so obvious at first, compared to the wide-open meadows and streams we encountered as we entered the northeast side of the park. But there was wildlife. 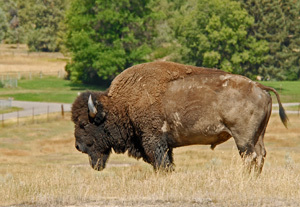 At first a few individual bison appeared picturesquely in the meadows not too far from the road. Then we saw whole herds browsing down by the river. And we had to stop the car when a pronghorn sprang merrily right across the road in front of us. Now that’s not something you see in New York! We spotted more deer as we re-entered mountain territory, and then I saw a huge white rock looming to my left, and knew we were almost in Mammoth Springs. Had to be. That rock held hot springs, or my name wasn’t Sandy! And I was right. We parked next to the huge white cascade of rock, and Dad and I climbed up and up to look at the wonderful, colorful hot springs. The water wasn’t falling over the terraces as it sometimes does, but it was impressive, nonetheless. As a final fare thee well, on our way out of Yellowstone we saw three female elk grazing on the lawn in downtown Mammoth Springs and four mountain goats climbing among the canyon peaks on our way out. Then we were traveling up the Yellowstone river toward the lovely dude-ranch where we’d booked rooms. We had the place to ourselves, being weekday guests, and I ended up with my very own cabin that was much bigger than my apartment at home!! After exploring the grounds a bit and looking across the river to the mountains that surrounded this place, I packed it in early. I’d been driving all day, and I was exhausted! But what a great, great day. Yellowstone today! We headed out right after a nice ranch breakfast – served to us by a young cowboy named Brian – and drove down through the Yankee Jim Canyon to the great Gates of Yellowstone, dedicated by Teddy Roosevelt. Our goals were twofold: the Norris Geyser Basin and Old Faithful. We set off down the narrow, winding road through Mammoth and up into the hills. The mountain and valley views to the east were amazing as we climbed higher and higher into the mountains. But more amazing to me was the first sign of volcanism that we spotted driving along toward Norris. It was just a few plumes of smoke out in the field, but I had to pull the car into a little pull-out and follow the trail down through a yellowing field of autumn grasses toward the steaming place. Soon, I heard the sound of water bubbling and churning. And there in front of me was a slightly elevated pool of steaming water, and a yard and a half from my feet was a bucket-sized pool of boiling, steaming water. I couldn’t believe my eyes. Out there in a field, water hot enough to boil, so close you could touch it (but nobody in their right mind would!) If you dropped some eggs into that stuff, they would boil instantly. But there was more to come. I returned to the car and drove onward, pausing a few times to gape at bubbling pools, billowing steam, at steaming vents pouring out from a cliff several hundred feet high, and at last pulled into the parking lot of the Norris Geyser Basin. My Dad and I armed ourselves with two cameras and a camcorder and set out. The stop today was the Porcelain Basin. 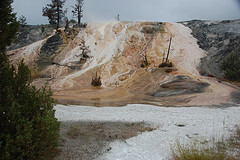 Steam vents, geysers, bubbling hot pools in shades from milky white to green to Caribbean blue, and streams of water which began red-orange from microorganisms that loved heat (grew specially in water 120-140 degrees F), and then “cooled” to spectacular green and yellow colors, which thrive in water from 100-120 degrees F. Amazing! Dad headed back to the little museum after about 20 minutes, but I spent an hour or more taping the sights and sounds and taking many pictures. What a surreal place! It was getting late, so I tore myself away and headed back to the car. I was ready for lunch! We drove another thirty miles toward Old Faithful, passing some amazing steamy places with hot streams running down the sides of hills colored white and red and orange. But I sternly resisted all such temptations, and only pulled up once when I spotted a moose wading in the river a few yards away from a fly fisherman. Now THAT was something I had to photograph! I was not the only one who pulled over to take pictures of that silly moose – tummy deep in water and calmly chewing away at something. It had absolutely no fear of all the strangers shooting pictures of it from the opposite bank, and companionably ignored the fisherman. I couldn’t help wondering which of them had gotten there first!! Then it was on to Old Faithful. The geyser was going off as I pulled into the parking lot. We watched from a distance; and then Mom and Dad headed into the lodge to find food while I parked. After the meal, Mom and I sat on the porch to wait for the next eruption. It felt so nice to sit down after all the driving. But I soon grew restless, remembering my camera was in the car. Then I spotted the ice cream stand and had to order a couple of cones. 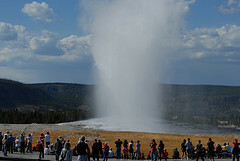 Just as I wandered toward Dad, who was sitting in the front row of the stands in the bright sunshine, waiting for the geyser to go off, the steam was suddenly cut through with a huge spout of water. So I stood there, balancing Dad’s ice cream cone and my huge camera with the massive 80-400mm lens, shooting off pictures of the geyser. Not a feat I’d like to repeat anytime soon! But I didn’t drop the ice cream cone and I got some nice pictures of the geyser. 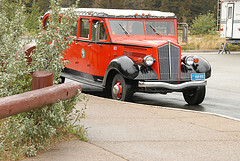 The return trip was long – two hours to get from Old Faithful back to the ranch. 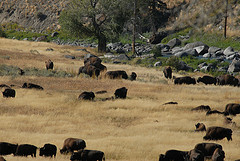 We saw some bison browsing next to the road, which was very cool! And we headed up to the haunted Chico Hot Springs to have dinner at the pool side café and watch people taking a dip in the hot spring for which Chico is named. 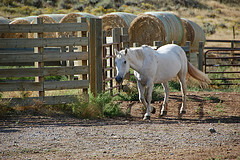 We made a quick stop at the local grocery for car snacks and then headed back to the ranch. But spooky business first. The manager of Dome Mountain Ranch had some great ghost stories to relate. The Devil's Slide. Quake Lake. The Disappearing Boxer, aka King Kong Clayton. And many more. Turns out that the ranch itself is haunted by a former manager who drowned in a boating accident about a decade ago Mysterious footsteps and slamming doors are often heard in the house which he was building at the time of his death. And once his ghost was seen walking down the upper hallway! After swapping stories for more than an hour, I drove down to Yellowstone for another look at the Norris Geyser Basin. This time I took the left fork with its mile-long walk through the basin.&nbsp; Oh my! 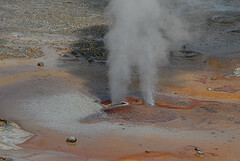 Spouting geysers galore, and bubbling hot pools full of boiling water. Steam spouts!A mud pit! What a surreal landscape. It took me an hour and a half to walk a mile!! One of my favorite spots was a large green pool in a private nook behind a small headland. It steamed and boiled slightly, and looked as if it belongs in the land of Oz. I kept looking for&nbsp;the Wizard, but apparently he'd stepped out at the moment. Our family group rejoined at dinner time, and we drove up to Chico again for dinner. This time, I brought my swim suit with me. That hot spring looked fantastic! As soon as we sat down, the guys in the next booth over called out to us. I turned around and saw Brian and Art from the ranch Brian had recommended we come up to Chico for dinner and a swim, and he was pleased to see we'd followed his advice. I turned sideways in my seat to talk spooky with the guys until supper arrived. Both Brian and Art had heard ghostly footsteps in the barn loft next door to the haunted ranch house while they were working Spooky indeed! After supper, I took a long, luxurious swim in the hot spring pool next to our restaurant. It was amazing! Swimming in the pool was like swimming in a gigantic hot tub! One side was eight feet deep and the other only three, so you could sit and enjoy or dive down under the water and swim like a seal! I did both! Mom and Dad had opted out of the swim, but both Brian and Art were there, and we continued trading ghost stories and travel tales until it was time to go home. A fun end to the day. Today was our last morning at the ranch. Brian brought us the best fluffy flapjacks I'd ever tasted for breakfast. Then Brian, Mom, and I drove out to see the haunted ruin of the original ranch cabin with its mysterious bedstead which moves all by itself! 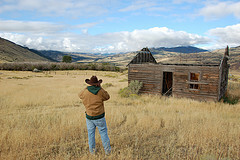 The cabin was all alone in a large field of tall, yellowing grass, surrounded by tall mountains, and it was only a few hundred feet from an Indian burial ground, which I also visited. Then we went down to the haunted house where the apparition of the manager was seen, and I also took a quick tour of the barn, and even got to meet a one-eyed white horse named (appropriately) Spook! We reluctantly said goodbye to the lovely Dome Mountain Ranch and set off for Virginia City, the original capital of Montana and a boomtown mining camp that still has about 100 residents and an incredible history. It was like walking into a movie set of the Wild West! 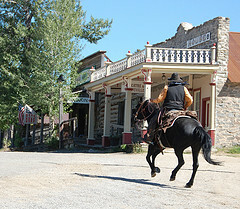 Board sidewalks, many of the original false-front buildings, horses tied to posts, and a stage coach giving rides out to the original gulch where gold was found! What a place! All this, and haunted to boot! I rode "shotgun" on the stage coach, up next to the driver, and got to ask him all kinds of questions about the local haunted house -- a white building with a false front that made it look like it had two stories. Apparently, it was once the court house, and then became a hospital staffed by nuns. The ghost of a nun sometimes appears inside, or walking around the exterior. Sometimes men's voices can be heard echoing through the rooms when the house is empty. And something -- or someone -- will sometimes run through the hallway in the middle of the night, calling: "The Gulch is on fire!" but no one sleeping in the house at the time can get out of bed or respond to the urgent call, because they are kept pinned to their beds by a mysterious force until the ghost has disappeared into the night. Just down the road was another old ghost town -- Nevada City. I took a quick tour of this fantastic site, which is mostly old log buildings, from the blacksmith to the school yard to the two-story privy! I met a nice fellow who was also touring the grounds. He was very familiar with the lore of Nevada City, and he spun me tales of the reenactments that took place there and rumors of ghostly spirits felt in certain old buildings. It added depth to my tour of the old ghost town! We ended the day in Butte, eating steak at a local restaurant and relaxing at a lovely hotel. My head was spinning with ghost stories and I thought I'd never calm down. I had to read a sci-fi novel to relax me enough to get to sleep! My last day in Montana. I will be sorry to leave this lovely state. We headed out in the morning for Gem Mountain, which is about 20 miles out of Anaconda, half-way between Butte and Missoula. It was a lovely trip on scenic Highway 1, through narrow canyons and mountain passes, and high valleys surrounded by snowy peaks. Finally, we arrived in a small clearing by a rippling stream, with several tents set up and tables everywhere. At the back of the clearing was a log building which housed the Gem Mountain store. To one side was a huge slag pile with buckets full of grit in front of it. For $14 you could purchase one of these buckets of dirt and pan for sapphires! And that's what we did. Mom and Dad bought one bucket and I bought one. Then a nice man showed us how to pour the dirt and gravel mixture into a "pan" -- it was a rectangular sieve with a wooden frame about a foot and a half long with close-set wire netting on the bottom. You lowered the sieve into a waist-high, freezing cold trough of water that was provided. It was filled with freezing cold, muddy water, and we made it muddier as we lowered the trays into the water, shook them up and down lightly to settle the gravel down and spread it out. This also caused the sapphires -- heavier than normal rock -- to settle to the bottom. Then we rocked the trays from side to side to make a heap of rocks in the center of the tray, turned the tray a quarter-turn, and did it again. And again. Each turn helped move the sapphires to the center of the tray and the large rocks and grit to the outside. I had to remove my hands from the water several times, because the cold made them hurt! When we were done panning, we took our trays to a picnic table covered with a thick rubber top and turned the trays upside down onto it. As the last of the water drained off, we searched for any sapphires that had fallen to the bottom of the tray during the panning. Then we slowly combed through the remaining gravel to find the rest. It was a long, slow process. Pan the gravel, Drain the water, Comb the rocks for sapphires. Repeat. At the end of four hours, I had about 34 ounces of sapphires, and 5 of them weighted more than an ounce and were large enough to be cut for jewelry. It was hard work, but I enjoyed myself immensely, in spite of the hot sun that burned my shoulders and kept me running back to the car for more bottled water! 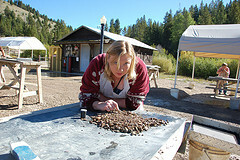 I was glad to have a glimpse into this life of a placer miner. Granted, we were mining for sapphires, not gold. But it was a similar process, and not one I would personally want to do for any length of time. If I'd lived in a boomtown, I would have run a grocery store and gotten rich selling supplies to the miners! We spent our last evening in Missoula, swimming in the hotel pool and eating our farewell meal at an Italian restaurant. Goodbye Montana! I hope to visit again soon.